This version of the classic dessert is easy to make and looks great. Use the lemon curd from the previous recipe. Serve two or three of them with vanilla ice cream or lemon sorbet and crème fraîche. Dust with icing sugar and decorate with mint leaves or finely pared lemon rind. Preheat the oven to 200°C, gas mark 6. Roll out the pastry to 3mm thickness and use a 5cm cutter to cut 24 rounds. Use to line the base of two 12-hole mini muffin tins and prick with a fork. Bake for 10 minutes or until the pastry begins to brown. Allow to cool, then fill each one with a little lemon curd. If you add too much it will bubble out while cooking. In a large, clean bowl, whisk the egg white until it is stiff enough to form soft peaks and hold its shape. Add the sugar gradually, until the mixture is thick and glossy. Top each tart with a little meringue and pull into a peak with the back of a teaspoon. 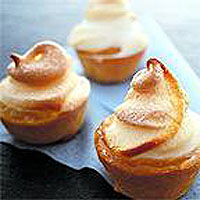 Place on the top shelf of the oven and bake for 7-8 minutes or until the meringue is just beginning to brown. Cool slightly and remove from the tin. If the end of your rolling pin is a similar size to the tin, use it to gently ease the pastry into the tin.